With the announcement the Queen’s Birthday Honours list, it’s time for the latest in our ongoing Honours-watch series of posts. In this, we search arbitrarily for ‘mathematics’ in the PDFs of the various lists, and hope our well-informed readers fill in the blanks where actual knowledge is required. Next week, scientists, science fans and science communicators will converge on Cheltenham town hall for a week of high-quality science festival. But how much of the programme is given over to the queen of all sciences, Mathematics? Here’s a list of some of the events going on we’d be interested in going to. At what can only be described as far too regular an interval for such things, it’s another Follow Friday! Here’s who you should be getting in line behind people to follow this week, as well as some of their recent interesting links. 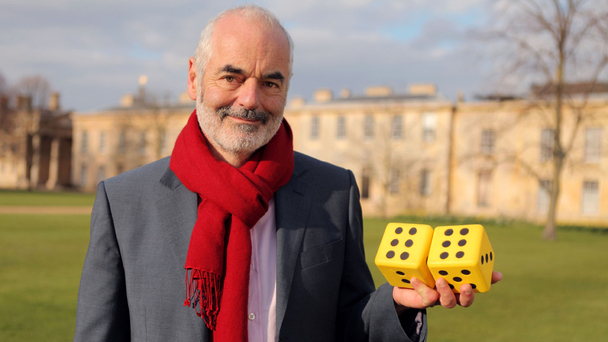 On the 18th of October BBC Four is going to broadcast a programme called Tails You Win: The Science of Chance, presented by Prof David Spiegelhalter, as part of its Big Science series. Smart and witty, jam-packed with augmented-reality graphics and fascinating history, this film, presented by Professor David Spiegelhalter, tries to pin down what chance is and how it works in the real world. For once this really is ‘risky’ television1. The film follows in the footsteps of The Joy of Stats, which won the prestigious Grierson Award for Best Science/Natural History programme of 2011. Now the same blend of wit and wisdom, animation, graphics and gleeful nerdery is applied to the joys of chance and the mysteries of probability, the vital branch of mathematics that gives us a handle on what might happen in the future. Professor Spiegelhalter is ideally suited to that task, being Winton Professor of the Public Understanding of Risk at Cambridge University, as well as being a recent Winter Wipeout contestant on BBC TV. It will be interesting to see whether they are eventually endorsed by Leveson, or whether Editors voluntarily sign up to them. Note that I present this information with no context or background, no independent expert quoted and no discussion of the limitations of the process that arrived at the guidelines. I’ve put a quote in the headline to make it seem more exciting while dodging the issue of editorialising. Perhaps I should claim the guidelines offer ‘a cure for bad science reporting’. Source: 10 best practice guidelines for reporting science & health stories.